Sometimes you just need a pair of amazing shoes. The kind that will literally put a pep in your step, making your day brighter when you glance down mid power-walk to remember that oh yeah, you wore those amazing floral shoes! The little bit of cheer can help shape your day, leaving you feeling (and looking) like a million bucks. Perfect example: Miley Cyrus’ floral mules are giving us life right now and inspiring our own spring style. Floral everything, including shoes? Maybe that’s groundbreaking! Regardless, we’re loving the chunky shoes Miley wore with a midi length wrap dress, accessorized with a camel hat and red bandana. The look is a little all over the place, but we love that these shoes still manage to pull it all together. Miley’s style has certainly evolved over the past few years, and we’re excited to watch it continue to grow. 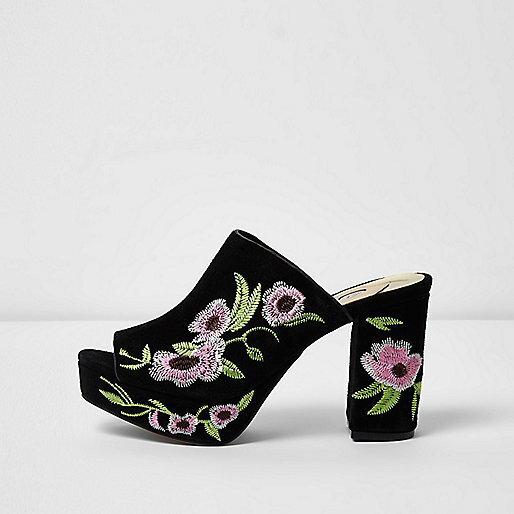 Until then, we’ll just be cooing over these shoes, because come on! These would look perfect with a suede skirt, some high-waisted jeans, and a vintage tee, or your favorite LBD. Versatile and stylish? We’re in! Not to mention the fact that the platform probably makes them way more comfortable. If you want to steal these shoes, not to fret. Here’s where you can buy them (and two other pairs that are just as good). Guys, she’s just bein’ Miley.